This paper explores the social dimension of collaborative design from the perspective of Schön’s reflective practice. An in-depth video protocol study was performed on the reflective practice in an experienced design team. It looks, in particular, at reframing: the process to find a new productive frame for subsequent activities. 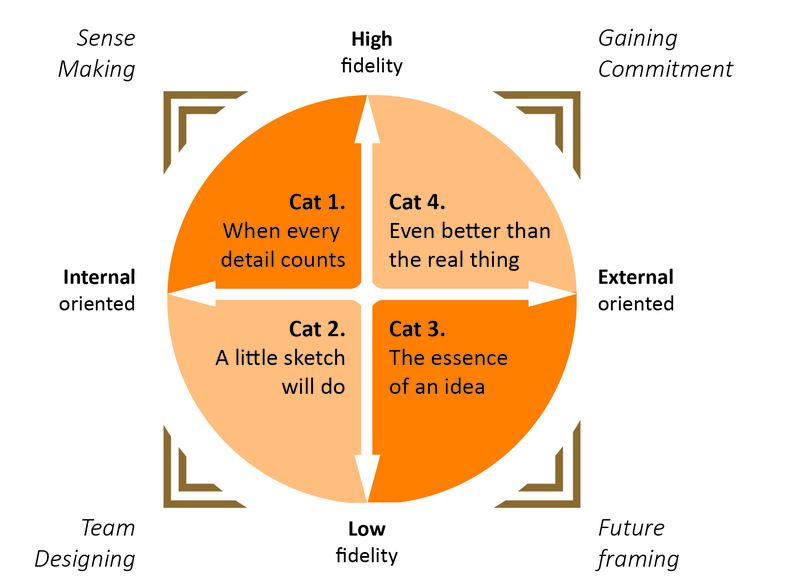 Reframing processes are amplified in a social context, requiring considerable time and effort on the part of design teams. Reframing has distinctive features that set it apart from other steps of reflective practice. 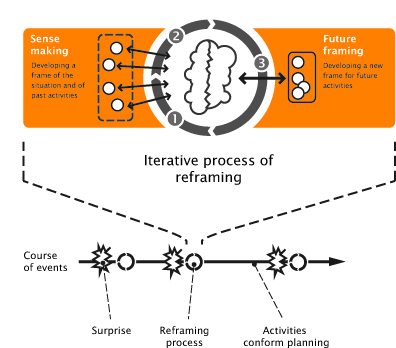 Two iterative stages are discerned: sensemaking, to reconstruct prior operating frames; and future framing, to design a frame for future activities. Surprises incite reframing, and we argue that surprises are a source for team learning and innovation.Keywords: collaborative design; reflective practice; framing; design practice; multidisciplinary design teams. The 2014 article (see below) updated, upgraded, reviewed and reviewed again. In product development, representations of the intended product are needed to enable specialists to learn about what they develop together. A variety of representations is deployed, and the difference between these representations is the fidelity: the degree to which a representation corresponds to the eventual real world product. We observed that some of these representations serve as boundary objects: objects that have a capability in teams and organizations to transfer, translate and transform knowledge across difficult epistemological barriers. The representations are categorized into four groups, and found that the ‘right’ fidelity of a representation is situational dependent where the situation is formed by the involved boundaries and aim of the social interactions. Stompff G (2013), prototyping new business. Article in CRISP magazine #2, November 2013. One of the main questions for companies in developing products or services is: How can we create new viable businesses for the future? This article presents a project that was done within a large company to explore new business directions. Stompff G, Smulder FEHM (2013), Mirroring: the boundary spanning practice of design. Chapter 7 in Bont C de, Ouden E den, Schifferstein R., Smulders F, Voort M van der (eds. ), Advanced design methods for successful innovation. A publication of Design United, Dutch platform for industry interaction on design research. Specialists inside New Product Development (NPD) teams often find it hard to understand each other. This leads to boundary forming within the team and it is found that designers have a boundary spanning capability, conceptualized as ‘mirroring’. Designers continually translate technical choices to the realm of product and/or user by means of expressive representations of the product. These representations enable the other specialists to reflect on their choices and those of others, i.e. cross-disciplinary. Two case studies where explicit mirroring process are described to span complex boundaries. Awareness of the mirroring process as well as the (visual) means deployed enhances boundary spanning. A qualitative empirical study exploring the contribution of designers to new product development (NPD) teams, filling a gap in literature. It is found that the user centered framing, the imaginative capabilities and the expressive skills, have a particular contribution: spanning complex boundaries inside organizations. Designers themselves are not nominated boundary spanners, rather the boundary spanning capabilities is a by-product of their design practice. We named this ‘mirroring’, which is conceptualized as the dynamical and ongoing redrafting of representations of the intended product, enabling team members to align and coordinate activities cross-disciplinary. Stompff G (2012), Embedded and embodied usability. Pp 138-140 in Kuijk J. van (ed.) Design for usability, Methods and tools, a practitioners guide. Publication of 3TU’s. Short summary of success factors for enhancing user centered design in product development, revolving around embodied cognition. Stompff G, Henze LAR, Jong, F de, Vliembergen E van, Stappers PJ, Smulders FEHM, Buijs JA (2011), User Centered Design in the wild. Proceedings of the 18th International Conference on Engineering Design , vol. 1, pp.531-537, Copenhagen. The paper describes User Centered Design (UCD) practice in new product development (NPD), whereby UCD professionals are embedded. Specifically the social nature of product development in large and close coupled teams is described, whereby the contribution of specialists is orchestrated whilst developing. A first finding is that boundary objects and -events that depict the intended outcome strongly contribute UCD. A second finding is that a ‘product story’ is a powerful tool to orchestrate the contributions of specialists. This is a coherent, plausible and shared narrative explaining what the product will be. Lastly it was found that synchronizing the natural UCD rhythm to the natural NPD rhythm also enhances UCD. Stompff G (2010), Case study in Brand Driven Innovation, in Roscam Abbink E. Brand Driven Innovation, AVA academia press. A case study to understand how the brand can drive innovation in a high-technology, business-to-business (B2B) organisation, and to explore how organisational culture and branding are connected. Stompff G (2008), Embedded brand: the soul of product development. Design Management Review, 19 (2), pp.38-46. This paper describes a method for articulating brand paradigms and how the it was used by different divisions in different years. The analysis across the cases revealed an unexpected consistency in brand paradigms that are interpreted as themes employees absorb as unstated but very real dimensions of the corporate culture. In the article, it is suggested that this ’embedded brand’ may serve as a guiding principle for developers and also discusses several caveats. Stompff G, Geraedts JMP & Jansen AH (2008), Being part of it: Design inside NPD teams. Proceedings DMI Education Conference, Paris. development teams (NPD teams) if the designers are core members of the NPD teams. The findings are set alongside the model of ‘the four orders of design’ of R. Buchanan. The paper provides insights in what designers can contribute to teams, beyond the aims of design. It also shows that the four order model serves well to enhance design capabilities. The paper suggests a new design challenge: how to inspire teams by expressing what a product can be, so that developers can reflect on their decisions. Bouwmeester K den & Stompff G (2006), Bridging the gap between literature and practice: usability testing Proceedings IEA 2006, Maastricht. limitations into account? The challenge is to create a form of usability testing that usable in practice without losing it’s usefulness. A case study describing a cross cultural evaluation of the perception of a design proposal. Distinct cross-cultural differences were found in the perception and appreciation of product appearance. Little cultural difference was found concerning the preferred values in design for the product type, yet cultural differences were noticed concerning the products chosen to portray these values. The research suggests that product appearance is appreciated best when designers and participants of the research share the same cultural background. The question is: How can the design of products communicate brand values? This paper is a case study, revealing how designers, as members of the product development team, exploit the profile, proportions, interface, and the color to convey and maintain a reputation for reliable professional equipment. Hekkert, P, Mosterd, M and Stompff, G (2003), Dancing with a Machine. A Case of Experience-Driven Design. In Proceedings of the 2003 International Conference on Designing Pleasurable Products and Interfaces, Pittsburgh. For experience-driven design much effort should be put into method development and elaborate case studies. In the paper, the design of an experiential copier on the basis of an interaction-centered design approach is presented. The interaction with the machine served as the base, in the form of a multifaceted experience, and translated into a concept design of a copier. The result is a design that affords the intended, rich experience in every design feature: it ‘invites you for a dance’.